Sometimes I wonder when I will ever learn. Here’s yet another example of a picture I really like that came about purely by chance, and only because I took thirty seconds to pull out my camera and actually attempt the shot. I was walking out of a building the other day when I saw some big fat drips falling from an overhang, and nimbly sidestepped them as they splashed on the pavement. And that was that–no second thoughts given on my part, and a good photo opportunity nearly missed. But then I thought I would try, just try, to catch one of the drops as it was falling. I am horrendously self-conscious when it comes to taking photos, and because a) it’s something I’m working on, and b) no one else was around, I knelt down and aimed my camera right up into the path of the drips. No way was autofocus going to work, so I put my camera in manual, set the aperture to f/4 and ISO to 200, and just motor-drove until the buffer was full (which, thankfully, is over 20 RAW shots on my D200–three times the buffer size on my D7100 even though the latter is a newer and much more expensive camera). 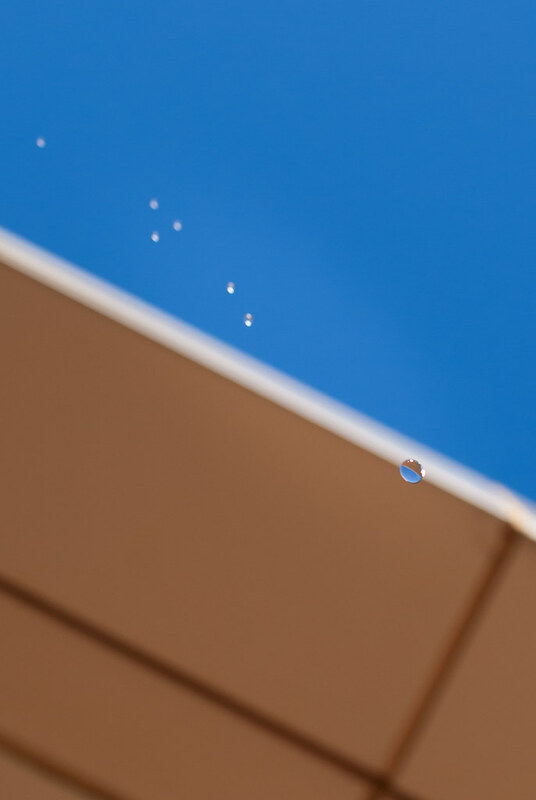 I kept scooting around on my knees with my camera aimed skyward hoping everything would line up for a good shot, and out of 43 images this was the only one in which the main drop of water was in focus. But wow, I sure am pleased with the results. I like the trail of smaller drops off to the upper-right, and decided to use a vertical orientation as opposed to my traditional horizontal style because it seemed to fit the mood of the picture better. I was also pleased with how the big drop perfectly inverts the colors of the overhang and the sky, and overall this required very little retouching in Lightroom. So keep that in mind the next time you are thinking you look like “that weirdo” with the camera. Besides, if you still lived in lovely Havelock, you would fit right on. You might even stand up there with Newt the Hatman and Franco the Dumpster Diver, and earn a name, The Camerman! Or maybe even something jazzy like, The Flash! I can totally relate to the feeling of being self-conscious while I’m taking pictures, and have missed opportunities because I would have had to kneel down or lay on the ground or something else. It kinda stems from taking pictures of snow on a tree next to my grad building on campus and having people walk by and laugh and say, “What is she doing?! ?” Got some cool pictures! But I know I could have gotten better ones if I hadn’t become so self-conscious. Something I’m working on! I had a similar experience one time, and even though the person was mostly just curious (and in no way making fun of what I was doing) it did make me a bit self-conscious. It’s something I keep working at, and I hope you continue to practice too, Elise! Thanks much! I did that whole self-conscious thing *again* Monday and missed a really neat horse picture at sunset, so it’s still a work in progress!